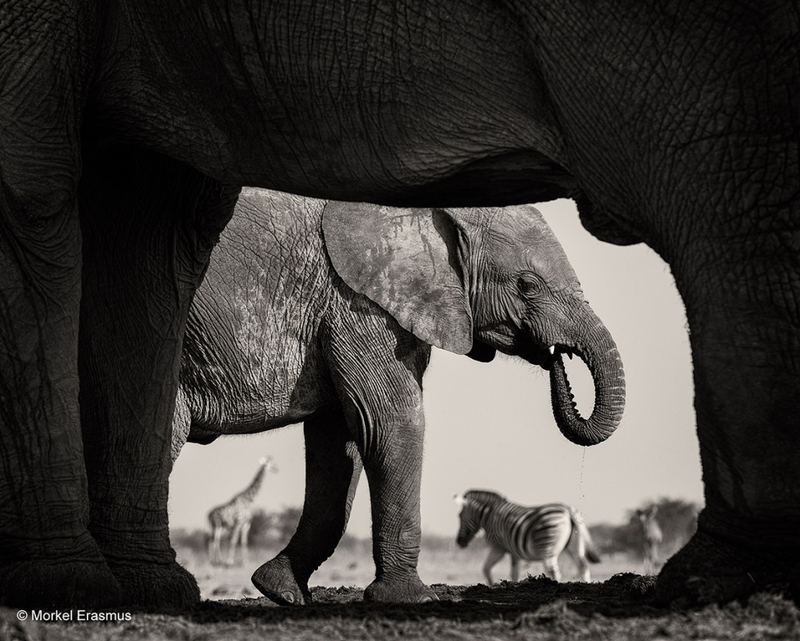 Amongst the prestigious group of 100 finalists was South African photographer Morkel Erasmus, whose entered image was taken in none other than Etosha National Park. 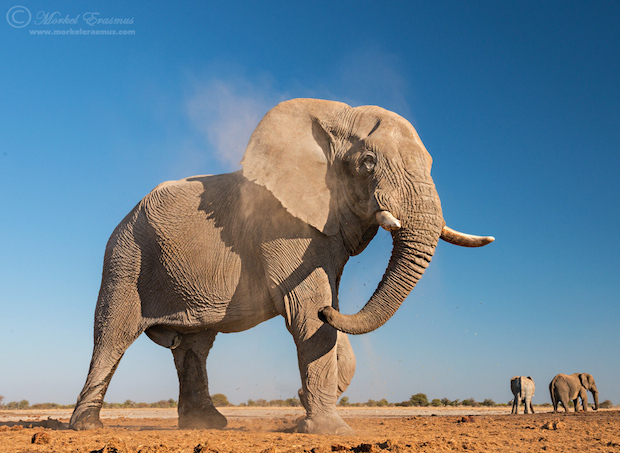 In fact, many of Erasmus’ most well-known and iconic images (including all three shown in this post) were taken in our beloved park, which is a favourite for photographers due to its uniquely striking landscapes, busy waterholes, spectacular skylines and – obviously – the general abundance of big game. PP: Did you jump right into wildlife photography the moment you picked up a camera? ME: I have always been visiting the wilderness areas of my native South Africa, being taken on various trips to places like the Kruger National Park and the Drakensberg mountains by my parents who were both teachers and thus had more holiday time to spend with us than most working parents (every school holiday). The passion for our natural heritage remained strong as I went off to study and eventually started working as an Engineer — until the day that I picked up my first DSLR camera … everything just clicked for me then (pun intended). I started purposefully traveling to the wilderness more, and focusing (another pun) all of my photographic energy towards capturing the animals and vistas that abound there. PP: Do you draw inspiration from any other photographers? And if yes, who specifically? ME: Constantly! I am convinced that you never really “arrive” in photography, and I have been so inspired by many other wildlife photographers in the world and also in my native South Africa, where there is a big culture developing around that and there are many amazing photographers who never really get noticed as much as they deserve to. Some of the “big names” that inspire me are Nick Brandt, Andy Biggs, Marsel van Oosten, Frans Lanting, Greg du Toit, David Lloyd, Paul Souders and Brad Hill. Local guys who are fast making a name for themselves and who inspire me are Lee Slabber, Hannes Lochner, Wim van den Heever, Mark Dumbleton, Grant Atkinson, Chad Cocking, Marlon du Toit and Gerry van der Walt. I particularly like to see a familiar scene/subject interpreted in a fresh way. PP: What separates a great wildlife photograph from just a picture of a wild animal? ME: It’s hard to pin down — but for me the photos that capture something of the soul of the animal and photos that capture decisive moments in nature stand out so much more than mere portraits and holiday snaps of wildlife. Portraits can be powerful, but that also depends on the photographer’s angle, use of light and overall composition. I think the really great wildlife photos tell a story so vividly that no words are needed, and they draw the viewers in, making them ask more questions about what happened in that moment. PP: In your bio you mention that your motivation is simply that you love everything about Africa, how do you feel this manifests in your photography? ME: Others have often told me they can see and feel my passion when they see my work. I believe that my drive to capture engaging moments artfully, skillfully and tastefully perhaps gets me closer to showing and conveying that passion deep down. I do perhaps lack a more documentary and conservation side to my portfolio — showing the harrowing effects that we have on Africa’s natural beauty — it’s something I am very passionate about and might work on more in the future, although it doesn’t always make for “beautiful” or “artistic” photos. 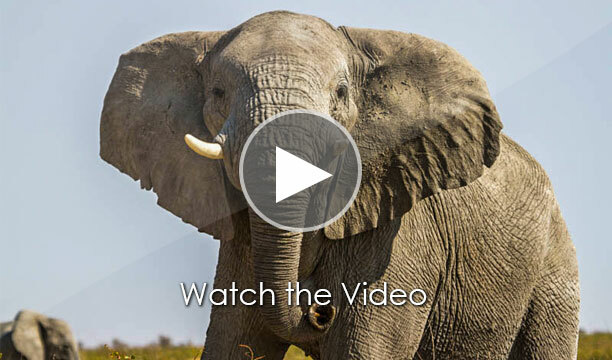 PP: What’s your favorite part of being a wildlife photographer? ME: Most definitely the privilege of being in the wild and (relatively) unspoiled parts of our wonderful continent, capturing fleeting moments of natural history as the circle of life ebbs and flows, and also sharing those experiences with those I love (my wife and kids and friends), like-minded photographer friends and the guests I am fortunate to take to these places now and again. I also love sharing my work, and viewing (and being inspired by) the work of others as they feel inclined to share. I think deep down as well, there is a sad realization that what I see and photograph today may not be there to show my children’s children one day with the way things are going — and that makes me savor those moments all the more. PP: The kind of wildlife photography that you do can be dangerous at times. Have you had any close calls you’d like to share with our readers? ME: There are a few, but the one instance that stands out involves African Wild Dogs on the my first trip to Mana Pools in Zimbabwe. We had leopard-crawled with our cameras in a dry riverbed to within safe ‘shooting’ distance so as not to disturb the pack who were relaxing in the riverbed. After about an hour of photographing them, the alpha male took notice of us, got up and walked purposefully towards us, bearing down on us and staring at us the whole time. When it got to within 10 meters from where we were lying motionless (due to excitement combined with fear), he took in our scent, gave us one more look, then slumped down totally accepting our presence — exhilarating stuff! 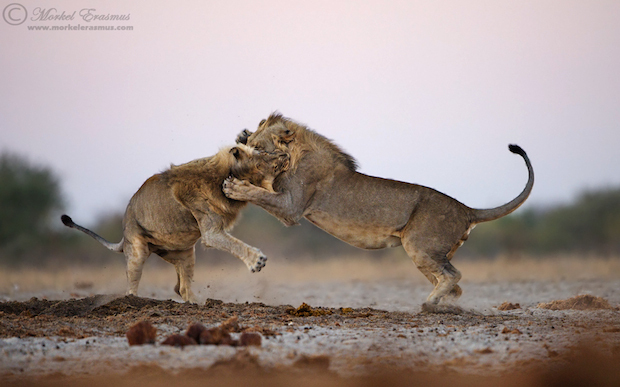 Another similar moment happened with a lion in the far north of Namibia. I was lying on my belly, going for that low angle, and the young male lions also approached with a keen eye. I eventually had to get back up and jump into the Land Rover which was parked next to me. PP: What about your favorite moments. Is there one interaction or experience that stands out above the rest? 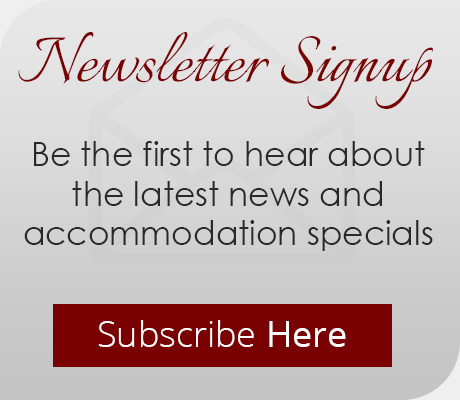 ME: One of my most memorable wildlife experiences has also been in Mana Pools, Zimbabwe. In this instance we were spending time with 3 elephant bulls on foot as they were foraging in the forest. The oldest and biggest of these bulls would continually raise himself up on his hind legs to reach the succulent leaves in the highest trees, and we spent about 2 hours running around the forest, changing our position to work with the light and capture this amazing behavior. The other special moment was recently in November when I was the only person to arrive at a waterhole in Etosha, Namibia, and witness a pride of lions take down a large giraffe bull — spellbinding stuff that reminded me of the cruel necessity of the life-and-death cycle in the African bush. PP: Any advice for budding wildlife photographers? ME: Firstly, respect your wild subjects and their environment. You are mostly a visitor in their world — so tread lightly and don’t bring undue stress to the animals in the pursuit of getting your shot. Secondly, be prepared to put your work out there. It’s doing nobody a favor just sitting on your hard drive. Share it on social media and nature photography forums. Thirdly, be honest about your work when you do share it. Declare when you’ve used bait, declare when the animals weren’t truly wild, declare what you’ve done in processing when sharing your work. You don’t want to be duly embarrassed like the guy who was stripped of his BBC Wildlife Photographer of the Year award for using a trained animal to stage an unbelievable photo. Lastly, solicit positive critique from people who you trust and whose work inspires you. I’ve grown the most when I’ve taken constructive critique from established photographers to heart.